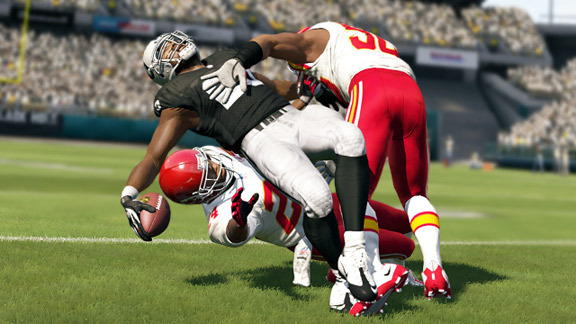 Madden 13’s Fall From Grace – An Abrupt Turn For The Worst? If you consider the way Madden was going with their announcements of Connected Careers Mode and Real Time Physics it seemed as if the sky was the limit. Now it feels like someone has come to your 4th of July party and taken all of your fireworks. EA Tiburon has announced many new limitations for Madden 13 since the vaunted reveal of Connected Careers. Darren McFadden should probably have an injured knee, back or right arm after this hit. However, thanks to EA and the NFL, this will most likely result in nothing more than a regular tackle and recovery… every single time. – You can no longer play more than one game per week and it must be for only your team. This is a big deal for people that like to play random games along the way of their season to expand their enjoyment of the league as teams evolve… or to throw games like the 1919 White Sox so their team can make the playoffs. Either way it goes, this limitation is silly and only hurts EA from the perspective of once again taking away any sort of further depth a gamer may want. – Editing players is completely gone for Connected Careers. Perhaps the biggest kick in the analog stick was the news that you can only edit players for Play Now games but not for your team before you start your Connected Careers Mode. So, not only can you not edit your players… but now you have to hope that you bought the game new and got the $10 Roster Update Code included with the retail release. Then you have to suffer the more unfortunate fate of having to depend on the Ratings Czar, Donny Moore. – Ratings still determine everything…and nothing. That is the real question facing Madden and NCAA. Are these games really football? Something that has troubled many football fans lately is the constant focus on ‘safety’. If you want to be safe, play golf. Football is about blood, guts, glory, concussions, playing hurt and yes… violence. It is a game where every single play the goal is to destroy the player carrying the ball. The NFL is taking it away from the game as much as they can but EA is taking it away altogether. There are no late hits in Madden NFL Football. There are no real time injuries to go with real time physics. There are no roster edits for your (or any other team) before you start a Career Mode. Which really starts to beg the question. What exactly is in Madden outside of a couple of what now seem to be aesthetic changes to the game? I’ve been waiting for Madden 13,and now I’m not even going bother buying it.This is a BIG disappointment.The 1st time I haven’t bought Madden since the franchise started.